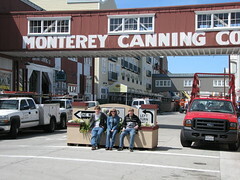 If you would tell me to leave Sacramento at 9 am, drive to San Francisco, drive through China Town and down Lombard St., walk the Wharf AND be out of SF by 12 noon, I would say that it couldn't be done; but we did it (SF tour on FF) We next headed for Monterey and Cannery Row, enjoying calamari on the wharf. The last two times that Esther and I have driven the Big Sur Coast, she has been miserable, so this time I insisted she take some dramamine. It worked great! We all enjoyed the spectacular scenery in the brilliant Pacific sunshine.